PRODUCT DESCRIPTION: Glue trap which features a honey comb pattern on a glue which is ideal for catching and keeping honey bees trapped. 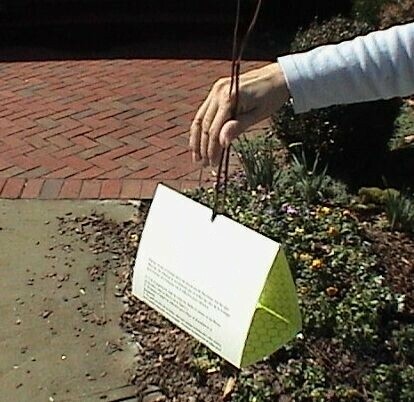 Use this trap outside entrance and exit holes following treatment for when you are wanting to eliminate the rogue and straggler bees which could be active many days following the initial application. Honey bee nests can be quite huge and though a successful application will eventually kill off the entire nest, it could take a week or more for all members of the colony to die. The use of this trap will help speed the process. This trap features a special food/pheromone lure which is set out in the glue. This odor is sure to catch their attention and once they land in the glue they are caught for good. Change out the trap as needed; large nests with many bees could fill several of these traps before the nest is totally inactive. WHERE TO USE IT: As close as possible to the nest and generally in the flight path of the entrance/exit holes used by the colony. RATE OF APPLICATION: One trap per entrance hole. Traps can hold 150+ bees but its recommended that you change them out once they're 90% full.